As of 1.09.2018, two new products are available at the Eesti Gaas stations across Estonia: rohegaas (green gas) and maagaas+ (natural gas+). CBM (compressed biomethane, also called green gas, rohegaas) is one hundred percent local renewable fuel, produced at Kunda from biogegradable waste. CNG+ (compressed natural gas+, maagaas+) is a mix of imported natural gas and green gas. 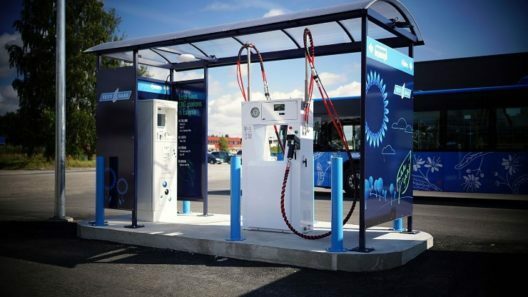 “As of spring, two new compressed gas products are available for passenger vehicles at the Eesti Gaas stations, and in order to make sure their names would reflect the product itself and to make the selection process easier for the client, we decided to make the product names more specific,” said Raul Kotov, member of the board of Eesti Gaas. “Thus, from now on, the vehicle owners can choose between a product that is 100% Estonian and a combined product based on imported natural gas. The chemical content and quality of the gases are equal, and both are suitable for cars,” added Kotov. Compressed gas stations of Eesti Gaas are currently located in Tallinn, Pärnu, Narva and Tartu (see the map). This autumn, new stations are opened in Viljandi, Rakvere and Jõhvi, and the station chain will continue to expand also in future.